The tunnel finisher produces a quality finish, lint and crease free. The careful temperature control provides a secondary thermal disinfection. Workwear is carefully examined, if all quality standards are met garments are sent for despatch. If a repair is requirement workwear is repaired to the highest standard and all repair information is uploaded to our Giltbrook hub. Repairs are re-examined at the Quality Audit point before despatch. Crisp presentation is achieved through automatic folding of workwear. In addition Hygiene critical workwear is single sealed in blue tinted packaging to guarantee the cleanliness of workwear right up to the point staff put on their garments. 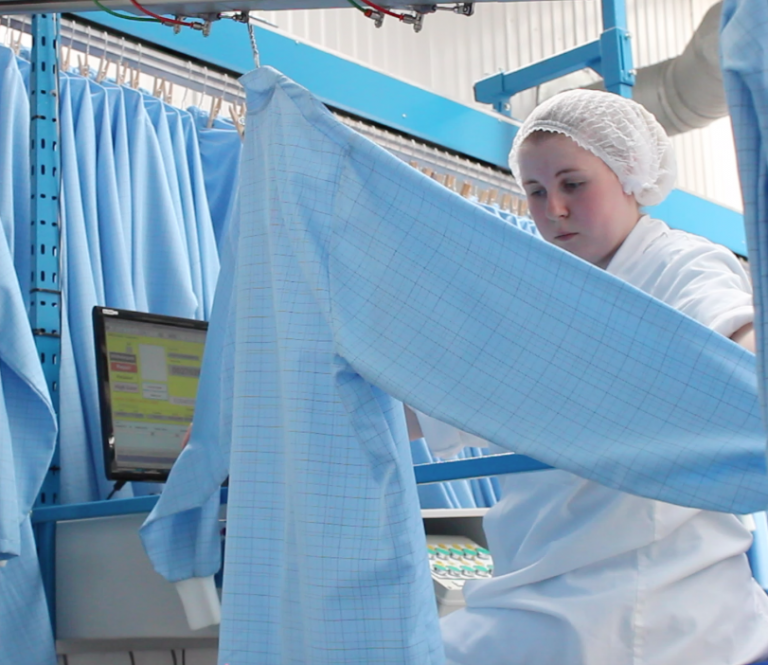 Garments go through a number of wash processes ensuring thermal disinfection for excellent wash results every time. Garments are processed in the high care section, where staff wear food grade coats, mob caps and shoes and sanitise hands in line with HACCP regulations ensuring they meet strict hygiene standards inside the controlled area. This facility features a Positive Air system which filters the volume of air every hour. Our wash processes are monitored by our detergent suppliers, testing the wash process by checking target temperatures, alkalinity strength, and wash action making sure they are consistent.